Foreign students will get a chance to experience Korean culture at an event at Chungnam National University in Daejeon on Thursday, the Korean Culture and Information Service said. 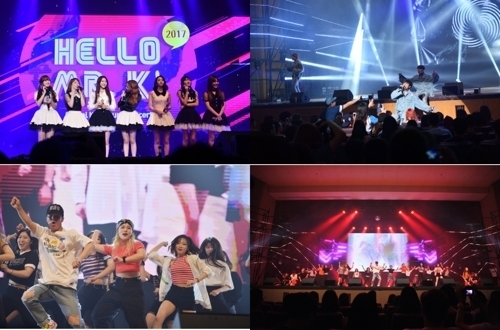 The event, consisting of a forum to culturally engage foreign students in South Korea and a cultural concert titled “Hello, Mr. K!” is the fourth of its kind, having been co-organized by KOCIS and the Korea International Broadcasting Foundation every year since 2015. The program is designed to help foreign residents in Korea better understand the traditional culture. There will be a series of traditional and contemporary concerts for some 1,800 foreigners living in Daejeon and South Chungcheong Province. This year’s program will include performances by K-pop girl groups Girlfriend and Sha Sha, boy band Varsity and the first LED dance crew in Korea, Saengdonggam Crew. Fantasma Korea, Chungnam University’s dance crew composed of foreign students, will also present its K-pop numbers. There will also be traditional samulnori and pansori performances reproduced in a modern context.